Trim-A-Tree Shop Hop Starts Tomorrow! Our annual Eastern Iowa Shop to Shop Hop begins tomorrow morning, Thursday, August 11 and runs through Saturday, August 13. Each participating shop will be giving away a free pattern for a Christmas ornament! 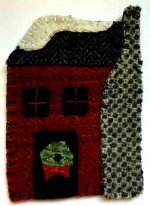 We designed a cute "Holiday House" ornament from wool. Of course, we will have kits available, too! Visit all 6 shops to qualify for some great prizes, including $450 in gift certificates! MAGAZINE DEBUT! Garage/Tent Sale! Be sure to mark your calendars...this event is going to be bigger and BETTER than ever! Our debut in the Fall Issue of the Quilt Sampler Magazine is the same week. We are starting to make kits for our projects...more info on pricing soon! See more details on our sale here.